This pretty waste paper bin is the perfect place for putting all that rubbish. 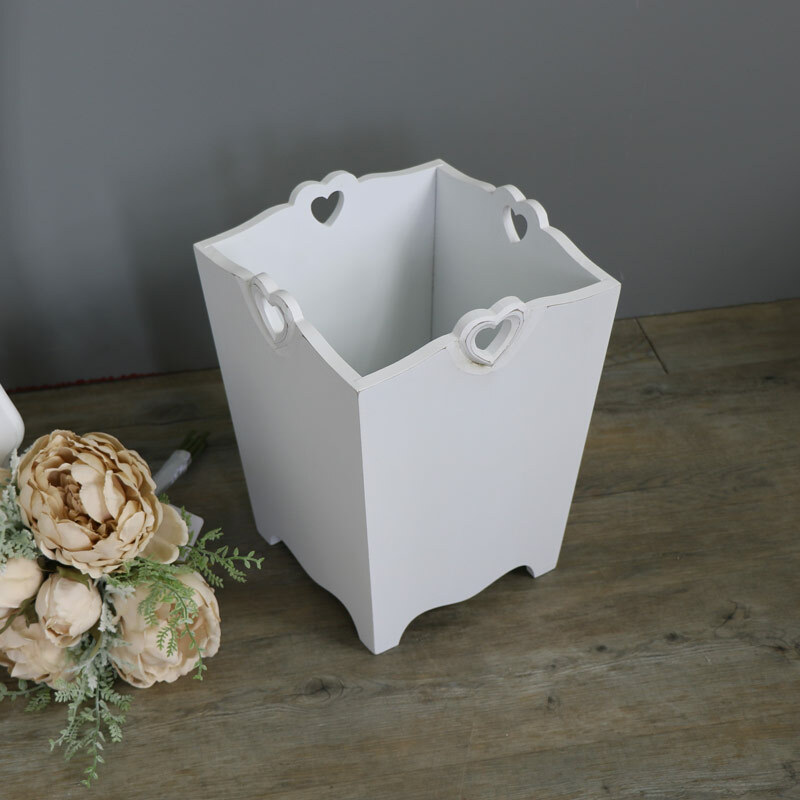 Painted in a fresh white colour with a pretty custout heart.Heart Detail White Wooden Waste Paper Bin (small) So much better than your standard rubbish bin, this little wooden bin is ideal for any room and so pretty. Of course this bin is so pretty it doesn't have to be used as a bin, why not use as a vintage planter instead or simply for holding little bits and bobs. Ideal for using in the living room, bedroom, bathroom or office. So much better than your standard rubbish bin, this little wooden bin is ideal for any room and so pretty. Of course this bin is so pretty it doesn't have to be used as a bin, why not use as a vintage planter instead or simply for holding little bits and bobs. Ideal for using in the living room, bedroom, bathroom or office. 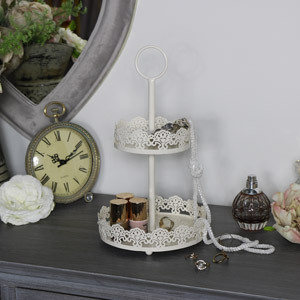 Made from wood and painted in white with slitght distressing around the heart to add a little vintage appeal. We have a great selection of waste paper bins that will add to your decor. 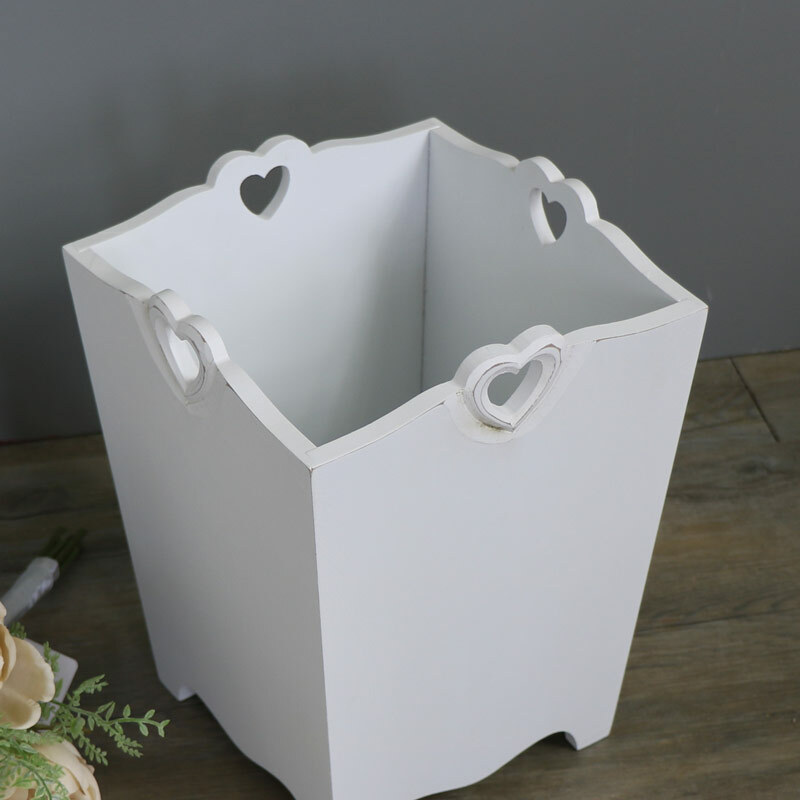 From our homeware and gifts collections, this is a small Heart Detailed Wooden Waste Paper Bin, which is made from wood and painted in white. Each edge is shaped and includes a carved heart which can be used a handle. Its uses could extend to it being a store or, with a liner, as a planter. It is 19 cm x 25 cm x 19 cm (width x height x depth) at the top but narrows down towards the foot which is also shaped. There is a larger version of this bin.